The Pew Research Center released new data this week on Americans' text-messaging habits. According to Pew, 83 percent of American adults now own cell phones and almost three-quarters (73 percent) send and receive text messages. The research only looks at adults' usage of text-messaging, but it does find that younger adults are much more active texters than older age groups. Cellphone owners between the ages of 18 and 24 exchange an average of 109.5 messages a day -- that's more than 3200 messages per month. That's compared to about 41.5 messages a day for all cellphone owners, a figure that's largely unchanged from figures reported in 2010. The Pew study doesn't look at the texting habits of those under age 18, but a study released last year by Nielsen found that those cellphone users in the 13 to 17 age range were the most avid texters among any age group. According to this 2010 Nielsen data, people 18 to 24 sent an average of 1630 texts per month -- about half the number Pew says this group currently sends. And that Nielsen report pegged the texting rate of 13 to 17 year olds at 3339 per month -- approximately what 18 to 24 year olds are now sending and receiving. One might wonder: does the texting rate of 13 to 17 year olds continue to be twice that? Certainly that age group -- in fact, all those under 18 -- are increasingly likely to be cellphone owners. According to those surveyed as part of Project Tomorrow's 2010 Speak Up report (PDF), more than half of middle and high school students (51 percent and 56 percent respectively) own a cell phone (without Internet access). In addition, 34 percent of middle schoolers and 44 percent of high schoolers own a smart phone. With the ubiquity of cellphones, many schools are facing questions about what to do when students bring cellphones to school. Ban them outright? Require they be kept in a locker or backpack? Require they be turned off? Allow them to be used, at teachers' discretion, in class? The reasons why cellphones are banned are, interestingly enough, many of the same things that make cellphones a potentially very useful educational tool: cellphones, particularly smart phones, are powerful mobile computing devices. If the cellphones have Internet access, students can use them to look up information online. Cellphones double as calculators and as cameras. And unlike iPads, e-readers, tablets, smart phones, laptops or desktop PCs, these devices are ubiquitous. Moreover, as the statistics indicate, text-messaging seems to be the preferred method of communication of teens. The popularity of text-messaging has long been given as one of the main reasons why cellphones are a distraction in the classroom. If students are texting, they're not paying attention. Texting is often viewed as the new form of passing notes in the back of the class. Remind: Remind allows teachers to send text messages (and email) home -- to students and/or to parents -- to offer reminders and updates for class. Remind allows teachers to communicate with their classes without either teacher or students having to share their phone numbers. Poll Everywhere: As the name suggests, Poll Everywhere allows teachers to use cellphones for polling in class. Students text their responses, using their cellphones to give feedback, answer questions, take quizzes. Celly: Celly provides SMS-based group messaging. Classrooms can use the service to take quick polls and quizzes, filter messages, get news updates, take notes, and organize and hold study groups. The groups can be public or private, moderated or open. StudyBoost: StudyBoost allows students to study via SMS-based quizzes. The questions can be self- or teacher-created, and can be multiple choice or open-ended. Of course, the availability of these tools does not mean that all cellphone usage is de facto educational and that all texting in class is on-topic. 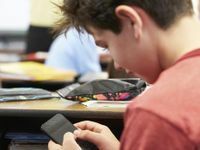 As with any technology, cellphones do require policies for acceptable use, and students need guidance on exactly what that means. But these new tools do give educators a range of options should they decide to let students turn their cellphones on in class. Many of these tools have been designed with the classroom setting in mind, and have privacy policies, moderation features, and analytics so that teachers can feel more confident in how texting is being utilized. But most importantly, perhaps, with cellphones becoming increasingly ubiquitous, text- messaging tools are less likely than smartphone or even Web apps to exclude some students because they don't have access to the latest technology.